I like to think that I’m a “cool mom”. At least I can be. But when it comes to dying my kid’s hair I’ve always been against it. I want(ed) to keep my kids hair as pure as possible so even hair products rarely touch their heads. Kind of weird since obviously we wash their hair and who knows what all those crazy chemicals really do but I digress. Disney’s Descendants came along last week. Mal with her purple hair and Evie‘s blue hair. Of course, my girls went nuts over their hair and began asking again if they could dye their hair. I finally agreed (yep, without even talking to my husband) but with only 3 weeks until school starts up we needed something completely temporary. I still wanted something less harsh so as I’ve seen before, we went the Kool-Aid route and I’m going to show you how to dye your hair with Kool-Aid. Dyeing with Kool-Aid was fairly simple but on my oldest’s dark brown hair it didn’t really take. We tried both purple and red and soaked it for a long time but you still couldn’t see the color in it. I think next summer I’ll probably make it up to her by getting her hair dyed professionally once and for all. My youngest’s insanely blonde hair did just as I hoped it would – GORGEOUS bright color. 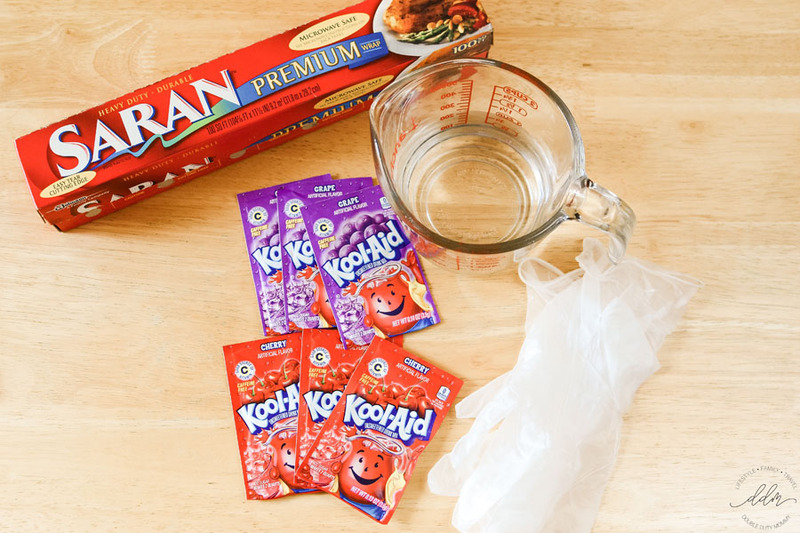 So if you’re looking to experiment and want a temporary color that’s semi less chemically (yes, that’s a word) go grab a few Kool-Aid packets and follow along to learn how to dye your hair with Kool-Aid. You’ll first want to cover your table with plastic wrap and put on disposable gloves. We still ended up with some splatters of Kool-Aid on the table but I later got it out with rubbing alcohol. Next time I’ll cover the table with a bigger piece of plastic wrap for sure. Also, you’ll want to use an old towel around you because it will get stained too and it doesn’t come out. Boil water and kool-aid on the stove in a small saucepan. I wanted to make sure the color was bright, bold, and lasting so I put 3 Kool-Aid packets in with 1 cup of water. I added more kool-aid and less water to really saturate the hair with color. Once the Kool-Aid is at a rolling boil remove from heat and transfer to a heat resistant container. As soon as possible, carefully submerge hair. Water is extremely hot so go slowly. I put my daughter’s hair in a high pony tail then only put her ends in so we would end up with a faded tips look. 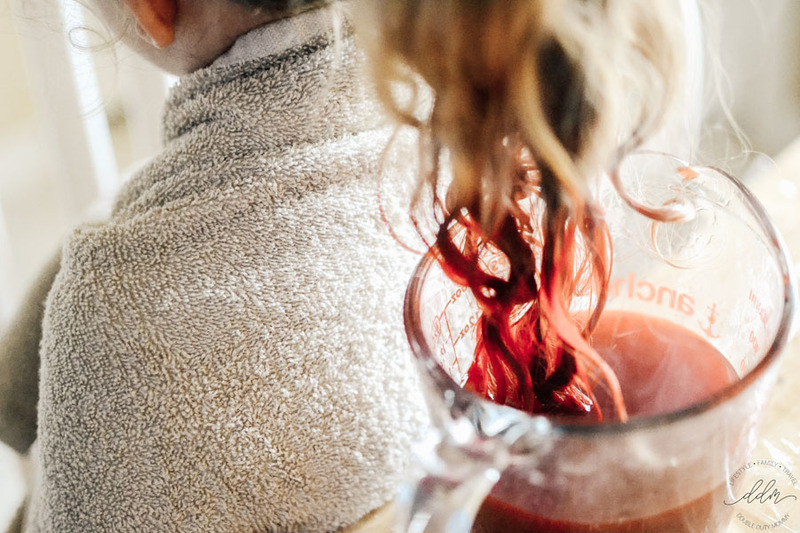 Lift hair out of the dye and carefully separate the hairs and resubmerge. I did this a few times to be sure every hair would have dye on it. After about 10 minutes slowly remove hair, squeezing out excess and blot with a towel (DO NOT RUB!). Let hair COMPLETELY dry then wash as normal. 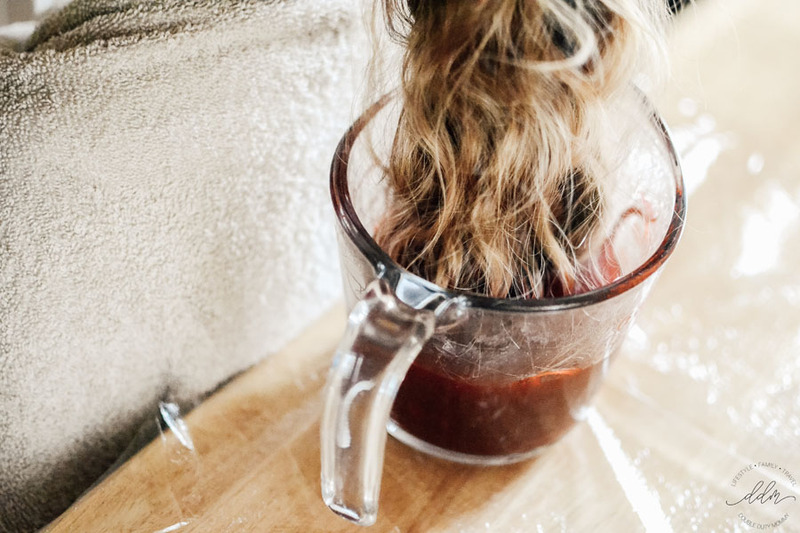 The Kool-Aid will naturally fade in about two-three weeks (depending on how often you wash your hair) but if you want it out sooner than that here’s how! Boil a pot of water on the stove. Once it’s to a rolling boil transfer to a heat resistant container. Add 2 Tablespoons of baking soda into water and stir. Dip your hair into water (up to 30 seconds). You should instantly see the dye coming off. Dip your hair a few times if needed. Hair will be extremely dry afterward so make sure you deep condition to rehydrate your hair. I’m sorry this has been your experience. There are a lot of factors in play to explain why her color won’t come out. But we have had great success doing this year after year and it ALWAYS comes out. I’m not calling it “temporary” just because. I’d keep trying to fade it out using my guide above because cutting it is not necessary and an extreme measure. Wow, the hot water will kill the hair. The hair is protein and the heart breaks the protein. This reminds me an experiment in the biochemistry lab… It is a good thing that the hair grows back. Thank you for your comment but I’m afraid you’re misinformed. “Hot water” does not kill your hair. If that was the case, do you always take cold showers? 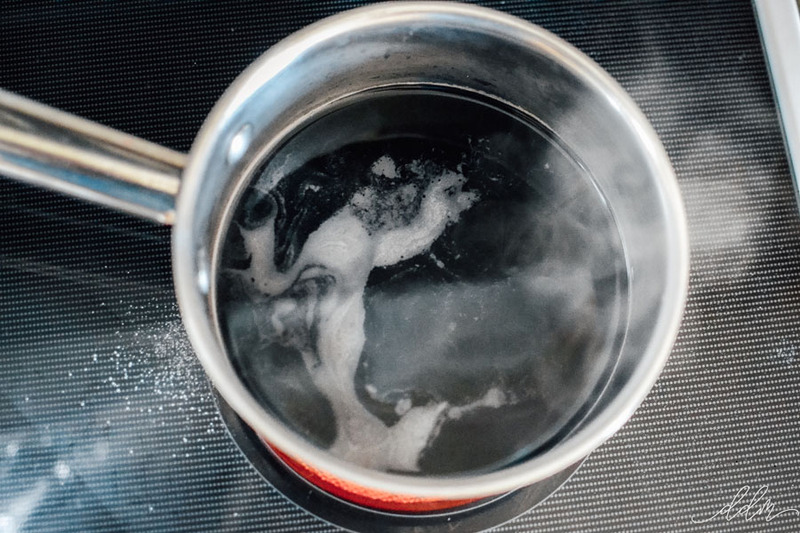 Now BOILING hot water on your scalp can cause the hair FOLLICLES to weaken and hair to fall out. But you aren’t putting the boiling hot water on your scalp with this tutorial, you’re dipping the hair in which will not damage your hair. Is the color supposed to bleed? To help prevent this, after dipping your hair, let it dry completely. Then wash your hair as normal really well. My daughter slept with a towel over her pillow for the first few nights which did end up with some color bleed. After a few washes, the bleeding stops. Do I have to let it dry in the pony tail?? Also, does it work the same for a lower ponytail? I’m sure it looks great. Definitely give it a wash, though. Ants will be attracted to the sugar in your hair! Yes this will still work with brown hair I have brown hair and the color came out insanely bright (I used 4 packets of Kool-Aid and 1 1/2 cups of water) and my aister has black hair and it even worked on her. So great to know! Thank you for sharing. What color works with dark brown hair? Will this work on strawberry blonde hair? I want to dye my tips, but I don’t want to use the harsh chemicals. Would this work if I used purple cool-aid? I wouldn’t see why not! I would just adjust the color to water ratios. More kool-aid, less water. Can it work if you already have blue or red hair? That I’m not sure about. I’m not a hairdresser so I don’t know how the Kool-aid will react with the hair color. hi i just read about this kool aid hair color now and am so exited to try it on my hair i have always wanted a red color on my hair. my hair is coarse and i wonder if this will work on my African hair, Cathy. What koolaid packet is good for PINK hair? I winged this technique after reading your blog last week. I used 1 cup of boiling water, 2 pkgs of Berry Blue (or is it Very Berry) and 2 pkgs of Blue Raspberry (so 4 pkgs total). We put the ends of her hair in for about 20 minutes. She has medium brown hair and this turned out so well! That’s great to hear!! Glad it worked out for you all. I’ll definitely have to try the blue in my older daughter’s brown hair since it worked for you. Hey I was curious what color did it turn out my hair is medium brown too. Thanks! This was so helpful! It turned out amazing and we really appreciate your tutorial. We will definitely be doing this again. Added bonus: It also confirmed for my kids that they probably don’t need to be drinking something that’s powerful enough to dye your hair in 15 minutes! Do you have to use Cool-Aid or will any type of Crystal lite do? I am like dying to know because I do not have Cool -Aid :)! I’ve never tried Crystal Lite for this. I had Kool-Aid on hand and have seen Kool-Aid work really well so that’s the route we took. Try it and then come back and let me know how it turns out! I think the crystal light packets have sugar in them already and the kool aid packets don’t. I’m looking for blue and purple Kool-Aid for my daughter’s hair and can’t find any at the five stores I’ve checked so far. Looks like you can buy it online in bulk, but I’m wondering where you got yours. Most of our stores seem to stock a liquid Kool-Aid preparation, but I’m guessing that won’t work as well. Any ideas? I’m not sure where you looked so far but I bought the purple at Target. I’ve even seen it at the Walmart near me too. I’m sorry I can’t be more help. Good luck!! I did this on my daughtet’s hair and it looks great but now I am reading that the hot water method makes it nearly impossible to remove even with baking soda! Have you tried removing it yet? I probably should have done more research as I thought this was more of a temporary color! We did this last year and the baking soda worked fine for us. We did it in stages, though. The color was extremely saturated though so the first round of baking soda didn’t take out all of the color and I didn’t want to ruin her hair. So after a week I did the baking soda again and that got the remaining color out. If you do the regular color recipe of 2 packet to 2 cups of water then 1 round of baking soda should take it all out. Hi! This seems like a very fun idea. My hair is not a very dark brown and it gets much lighter and many natural highlights in the summer sun. How many packets would you recommend for my hair? I’m only doing about three inches on the bottom ends of my hair, fyi. Thank you!!! That really depends on how bright you want the color and how long you want it to last. The more packets with less water, the brighter it will be and longer it will last. If you do even amounts of color and water you should get a pretty good color too. 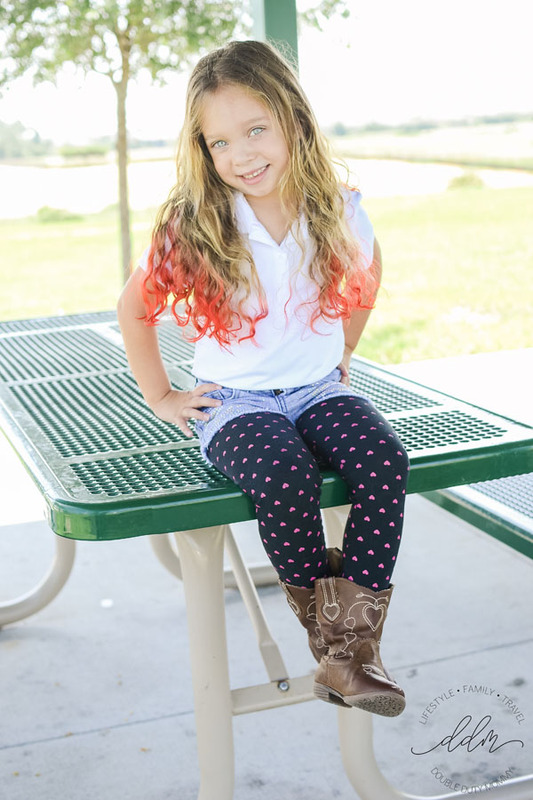 I used more color than water on my daughter’s blonde hair to get a fiery red that stayed for 4-6 months. This worked amazing on my hair! My hair color is dirty blonde and I used two packets of red kool aid and one cup of water and it came out great!!! Thank you so much for this different technique! All the other techniques did not come out as well as this. Thank you ! Great idea!!! My kids really want to try this! How well does it hold up if they swim every day? Does the chlorine cause it to fade or run when wet? Hi Amy, like any dye that has been set, it won’t make it run but it may fade it. Have a fun summer! We swam a lot last summer but I don’t recall ever noticing a huge change in the color. It probably depends on how often and how much chlorine is in the pool. Great idea! A paste for shorter hair definitely sounds like a better route. Color is probably brighter and more saturated though, I’m sure. Thanks for stopping by. How did you make the paste? Any extra ingredients? I wanted to color my son’s short hair. Thanks in advance! 2-3 kool-aid packets then slowly add conditioner until a toothpaste consistency has formed. This way tends to bleed more so you may want to test it out the first couple days by protecting pillow cases, ect. It also washes out sooner than the boiled recipe in my post. Thanks for this tip too..I have very short hair and was wondering how I would dip it or get it on..lol my girls hair is long no problem but paste may work better for me! Hi sweetie I’m was reading the comments and I’m wondering, how do you make the kook aid turn up into paste?! We haven’t tried it that way so I cannot be any help there. I have heard that if your hair is wet before dyeing it makes your hair look greasy until the dye washes out. Will this rub off on shirts, sheets, pillows, etc? I worry that after washing [over the following days] it would bleed onto whatever she was wearing while its wet. The first day we wrapped a towel around her pillow and it had a tiny bit of excess color the next morning. The days following were fine even when her hair was wet from the shower or pool. We used Cherry but any color would work. It really depends on your hair color and how saturated you need to make the mix and how long to let it sit. We tried it on our other daughter who has dark hair but it didn’t really show up that well. Fun! It definitely depends on how concentrated you make it. More packets and the same or less water will make the color brighter but stick a lot longer. Thanks so much for posting step by step and the quicker way to get it out. I was looking for something to do to surprise my oldest daughter today! aw Mya,you’re the sweetest. I totally understand your mom since I don’t let me girls dye their hair either but kool-aid is so easy and doesn’t harm your hair (as much) like regular hair dye. Hope this works great for you. 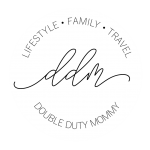 Tweet me a pic @DoubleDutyMommy if you ever try it! What a cool mum you are! 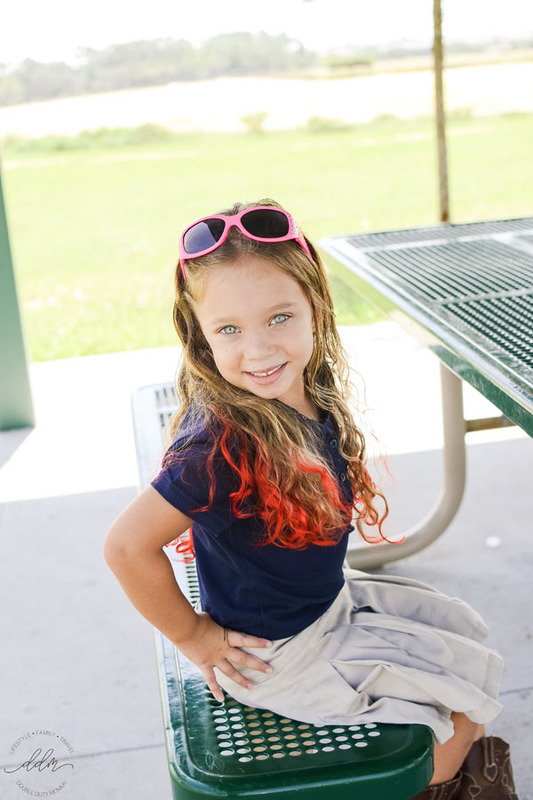 I had never heard of coloring one’s hair with Kool Aid, and I wish my hair was now longer so I could do this too! A safe way to dye children’s hair, very cool!! Look at how beautiful the outcome is, your daughter looks very pretty and obviously is happy with her stunning hair color. This has to be the coolest thing ever! 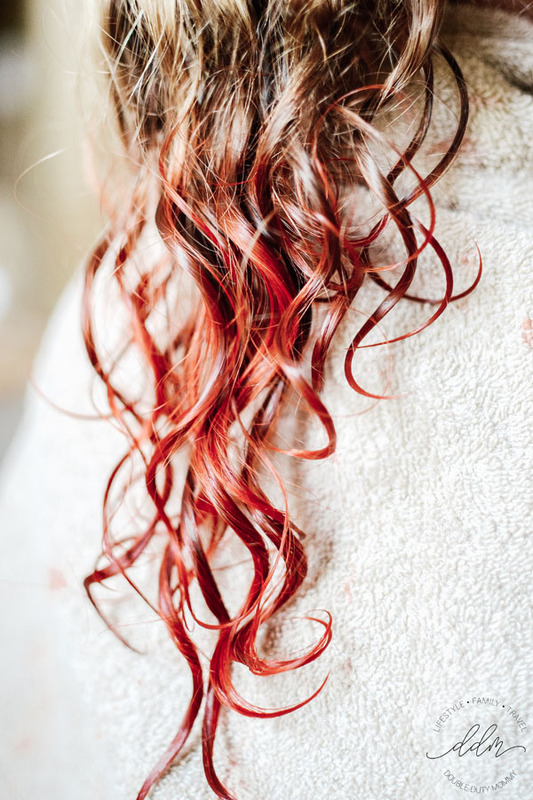 I need to try this on my niece – we’ve used the wash out dye before but it’s so damaging to your hair. You are a cool mom!! Your daughter’s hair looks great and I bet she is so excited! Sounds like a fantastic way to dye on a temporary basis. Wow! That came out awesome! Who would of thought to use Kool-Aid? We all have dark hair in this family so I am unsure if the colors would actually show but I think it’s awesome! That’s a fun way to get some temporary color in hair without committing to it. I definitely don’t like putting a lot of chemicals on my hair. Yes you are a cool mom. This is a cool idea! My friend’s daughter is 15 and has been using chemical dye for years. I think she maybe over that phase but I will tell her about this. Wow, it really takes the color doesn’t it?? It turned out great. Oh wow, I love her hair! I had no idea you can do this with Kool Aid. My girls would love this. This is a fantastic idea! I just love her hair. So beautiful. My girls see me dye my hair (brown bc I have so many white strands) and always want to dye theirs. Now we can! How fun is this! I had no idea this was possible. It’s so bright too! AMAZING I So Can’t Wait To Do This With My Girls Thank You!! This is so awesome! My nieces would LOVE this 🙂 I have never heard of this, and until now, I too was against dying kids hair (just personal preference). I might have to try this during Spring or Summer break next year. A little too late for us, as school starts Monday :/ I also love that you included how to get the color out quicker, if needed – thanks for sharing!! I have all boys, so we have never done this. I see girls with their hair dyed all the time and always wondered how they did it. Boys can use Kool-Aid in their hair too! Instead, mix Kool-Aid with conditioner and use a brush to paint it on their hair! I would stick to the tips for a cooler look. Maybe use one of those hair caps that you pull some hair through the holes? Not sure what they are called but my older sister made me bleach her hair all the time like that when I was 11-12, haha. Great idea for those of us with short hair too!